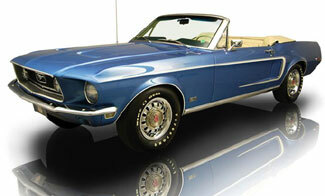 Here's a cool keeper from Dearborn: A beautifully restored, numbers matching 68 Mustang GT 390 4 speed convertible! Gorgeous in Acapulco Blue over parchment, restored from new convertible top to new suspension and documented by its Marti report this is an awesome looking, investment grade pony car! For 1968 Mustang GT restoration, new steering components, new brake lines, hoses and hard parts along with all new fuel components were installed underneath this car. Correctly applied red oxide primer with black overspray shields crisp sheet metal and inspection marks and details abound under here. Ford's 9" rear with 3.25 gears runs out back with a full rebuild. There's a new, correct exhaust system from head pipes to resonators to the crossflow muffler to the quad tips. Slide behind the deluxe wheel and sit on the freshly restored seat. There's a new wood grain knob on the Hurst shifter to keep your right hand busy while new pedal pads feel great under your feet. The fresh dash rides under a new dash pad, new carpeting and new sill plates make the floor look like new and new door panels sit at your side.